Perfect wallpaper for any project room. The Bad Usability Calendar from Norwegian company Netlife Research. At UI 11 last week I was fortunate to meet Eidar (photo) from Netlife Research. 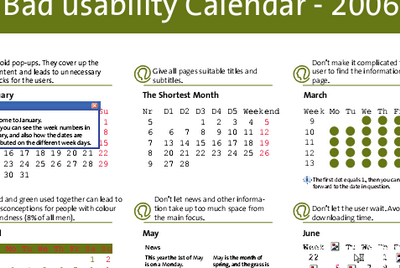 His usability firm made a Bad Usability Calendar, which is absolutely fantastic. I’m putting the link here directly, as their pages are in Norwegian. They also did a similar calender for 2005, but unfortunately only in Norwegian. And I will also print a poster to decorate my manager’s wall next to “The importance of User Experience” poster by Frank Spillers. In my opinion the best visual explanation of user experience. Update 2006-11-10: 2007 calendar is now open for suggestions. This entry was posted by Jesper Rønn-Jensen	on Monday, October 16th, 2006 at 10:07 (GMT-1)	and is filed under Accessibility, Best of Justaddwater, Humor, Usability, User experience. You can follow any responses to this entry through the RSS 2.0 feed. Both comments and pings are currently closed. nice examples of bad design! Since it is World Usability Day next week (with us of Experientia taking charge of the Italy event), I couldn’t resist posting this hilarious ‘bad usability calendar’. Go grab yourself a copy! On the following web application, please check out the two-month calendar widget overlay by tabbing to one of the date (depart and return) fields. I’d like to use this type of overlay for the “From:” & “To:” date fields on one of our Web applications but to do so it must be “Section 508 compliant” (i.e., also provide keyboard access to the calendars for mobility impaired users”). Do you know of any applications that have similar Calendar Widget overlays that are 508 Compliant?